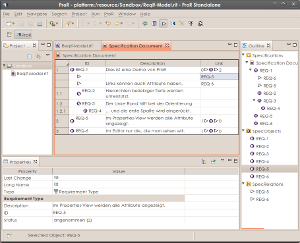 ProR is a tool for requirements engineering that supports the ReqIF 1.0.1 Standard natively. It is part of the Eclipse RMF project and is built for extensibility. ProR is the result of the European Union FP7 Research Project Deploy, where it is used to provide traceability between requirements and formal models. Vision: Our vision is to provide a tool that supports interoperability by operating directly of the ReqIF data standard, and that supports integration by taking advantage of the extendability of the Eclipse platform. ProR is targeted to academic and industrial users alike. Background: Requirements engineering is a discipline of systems development. A system can be anything, big or small: A new software, a plane, a telecommunications network - you name it. We are especially concerned about distributed development: How do you make sure the pieces fit together? How do you ensure that system does what you think it does? In practice, these issues are usually addressed by writing down requirements. Once written down, stakeholders can agree on them. An implementation should fulfill requirements, and ideally you can tell which requirements are fulfilled by which part of your implementation. This process creates a huge amount of information that must be managed. ProR is a tool for this purpose. You should consider using ProR when Word or Excel are not powerful enough any more to handle your requirements. 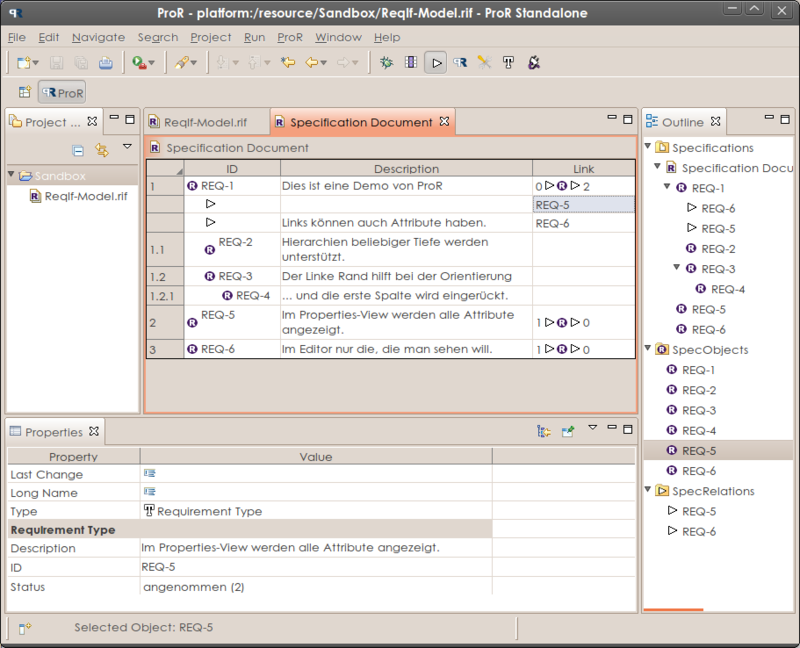 ProR allows you to set attributes on requirements. For instance, you can create a status attribute ("not implemented", "in work" "implemented"), or a text field for the owner. You can also create links between requirements. This would allow you to manage one document with the requirements and another describing tests. The link shows which test covers which requirement. ProR supports the ReqIF standard, a data exchange format for requirements. This allows you to exchange requirements with other tools, like IBM® Rational® DOORS®. ProR strives to be a powerful RE tool that fills the niche between "low-tech" solutions like MS Office and expensive commercial solutions like DOORS® or IrQA®. ProR supports the latest version of the ReqIF standard. The RMF Core also supports the older standards RIF 1.1 and RIF 1.2. A powerful extension point allows seamless integration with other tools. Interested parties include Airbus, Thales, MKS and many others that are listed on the Proposal Page.